Due to popular demand, Armorgard have developed more new and innovative products for the M & E sector. With more and more Health and Safety officers condemning storage of copper pipe on the floor, there has been a huge demand for a storage rack that is both strong enough to hold large quantities, but is also mobile enough for transporting around site. The Mobile Pipe Rack is available with a 1 tonne capacity and also a 2 tonne. It has been tested and each unit has its own certification for complete peace of mind. 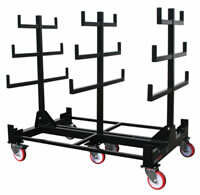 Being designed particularly for the hire industry, it is a collapsible, one piece design, that is also easily stacked. With the cost of copper having escalated over recent months, fittings and wire are at an increasing risk of theft, generally by other tradesmen working nearby. Armorgard, working with commercial plumbers and electricians, have designed a robust mobile fittings cabinet to minimise this risk. 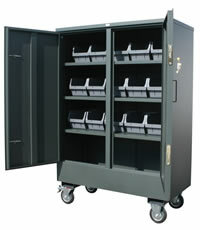 With adjustable shelves and removable plastic compartment bins, any contractor can have complete peace of mind that his material will not go walkies! Soon to be launched is the new PipeStor, or Copper Coffin as it is commonly known to some. Again, to tackle the ‘copper thief’ this is a 3.0m secure store, divided inside into 4 compartments, and accessible from one end. Designed for the hire trade, the PipeStor folds in the middle for storage and transportation. It comes complete with 6 castors which are suitable for construction sites. The 2011 Executive Hire Show promises to be the best ever as Armorgard make their debut at the show in Coventry. Held at the Ricoh Arena on 9th and 10th February, we will be found on stand D8.